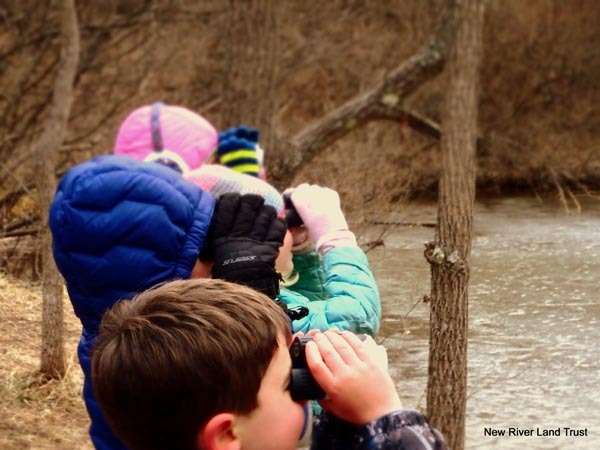 Thanks to support from Virginia’s Department of Game and Inland Fisheries Youth Wildlife Grant, the New River Land Trust is ready to help our service area’s youth get to know our winged residents! We have 30 pairs of binoculars and 12 birding field guides available for your classroom or youth group (K-12) to use free of charge! We welcome you to borrow these supplies for your next group activity or planned class outing. 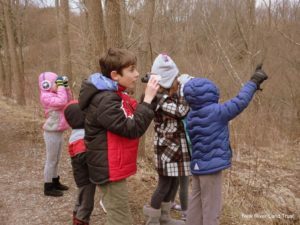 Enrich backyard birding on your school’s campus, a field trip to your local park, or a camping trip with access to our binoculars and bird guides. Connecting children with birds is an excellent introduction to nature because it provides access to a whole world they may not have explored but one that surrounds them. After some initial orientation to the tools and rules of birding, children can easily access the world of birds again on their own. Joy and a sense of accomplishment result when one recognizes bird calls, behaviors and markings on one’s own, and can help one feel rooted to the earth. A: Submit the form below to request binoculars and/or bird guides and to reserve the date of your event or activity. Q: Is there a time limit on how long we can keep the supplies? A: Binoculars can be reserved in week-long increments; however we are flexible about the length of time binoculars can be borrowed if scheduling allows. Q: I like this idea, but I am not a birder and I don’t know how to use binoculars—is Early Birders still an option for my group? A: The New River Land Trust can help you get started! Upon request, we can come to your location to lead an Early Birders Orientation, covering binoculars skills and a workshop for beginning birders. Q: Do we have to use the binoculars to go bird watching? A: You can use the binoculars for any type of wildlife viewing you wish to enjoy, as long as you’re getting outside and discovering nature!